25 Sep Lambs tank but only to OTH levels. Lamb markets continued to tank this week. It shouldn’t really come as a surprise, with the previous 850¢+ levels clearly unsustainable. Interestingly, over the hooks prices rallied, with saleyards and direct prices converging. All lamb prices were smashed this week. The east coast indicators finished Thursday between 97¢ (restocker) and 43¢ (light lamb) lower, all back in the 700s, except for heavy lambs which managed to stay at 818¢/kg cwt. Prices are, however, still way above the same time last year. 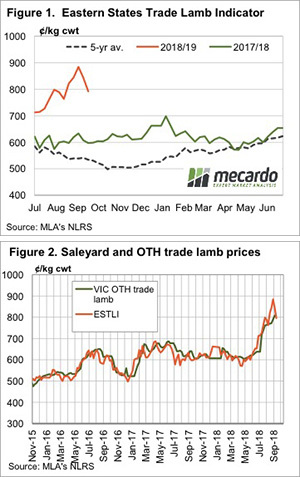 The Eastern States Trade Lamb Indicator (ESTLI) has fallen 92¢ from the high but remains nearly 200¢ above the same time last year. Prices may be down, but they are still very good. Over the hooks prices continued to move higher this week, following saleyards in order to get supply. With the ESTLI falling back to a comparable level to over the hooks rates (Figure 2), processors should be starting to get some more lambs direct. Perhaps this is why saleyard values have lost some ground. Mutton prices were stoic in the face of falling lamb values. As noted last week, mutton prices are still relatively cheap and processors are no doubt trying to fill up kills on animals which might still be making some sort of margin. The National Mutton Indicator rallied 10¢ for the week to a two month high. It looks like lambs are starting to move in the West as well. 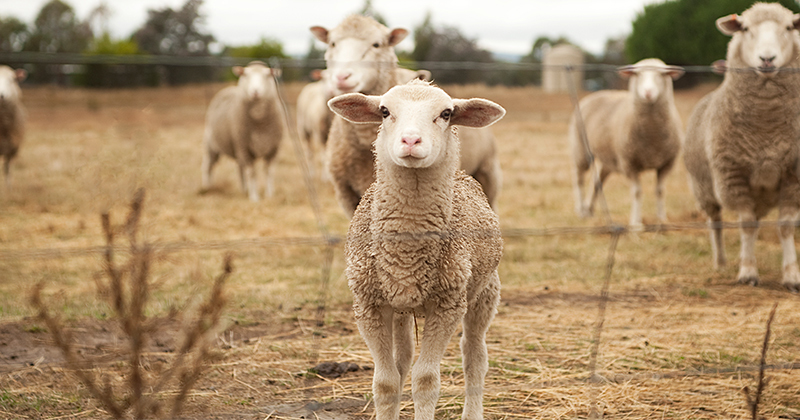 Trade lamb prices fell 28¢ to 633¢/kg cwt, while mutton lost 34¢ to 428¢/kg cwt. With prices still historically very strong, there shouldn’t be any complaints about the lower values. The question now is how far lambs prices can fall. Supply can ramp up, but only to a point as we know the ability to finish lambs this year is limited. Values above 750¢ are likely to continue to encourage anything that is at trade weights to hit the market, but if they fall below 700¢, sellers might take a punt on putting more weight on and looking for upside.